A lovely Thursday afternoon found me making my way to Cibo E Beve. It was a lunch date with Ruksana, a dear friend who happens to be a gifted writer+editor+entrepreneur+list-maker+trip-planner. She was running late from a previous appointment, so I ended up staring at the wood paneled walls, eating a little more of the bread and olive oil than I’d have liked, and drawing up lists of to-make recipes until she arrived. 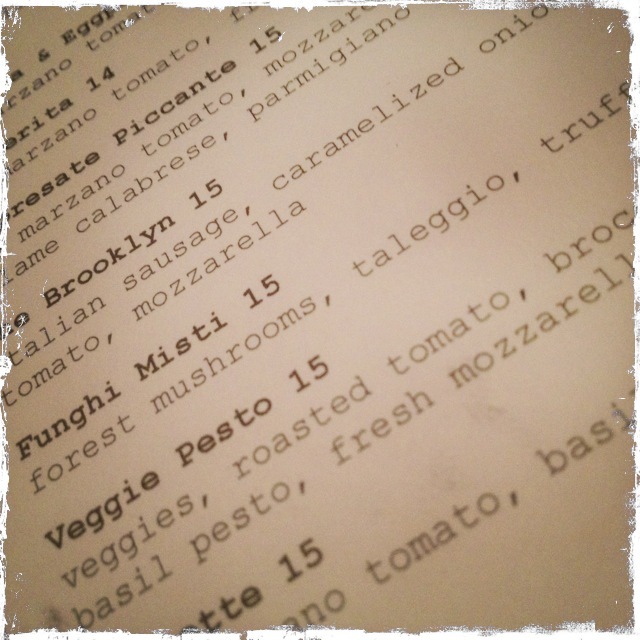 The menu at Cibo E Beeve is brief and there are a handful of vegetarian options. I thought that the Winter Fennel Salad (frisee, fennel, satsuma mandarins, smoked bacon, marcona almonds, buttermilk dressing) sounded heavenly. Minus the smoked bacon, of course. I half-thought I’d order it but as the minutes dragged on, I forgot. Winter Caprese (burrata, fried eggplant, heirloom tomato, balsamic, basil oil) also would be awesome, I think. After Ruksana arrived, we placed our orders. She got the San Marzano Tomato and Cream Soup and the Cibo Beef Meatballs. 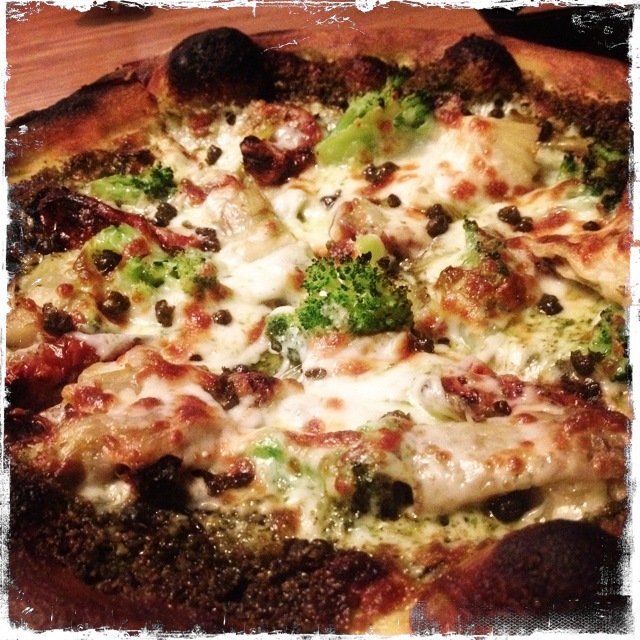 I asked for the Veggie Pesto Pie (veggies, roasted tomato, broccoli, pistachio-basil pesto, fresh mozzarella). Ruksana loved the food (you can go check out her review on Yelp). The portions were substantial too; she asked for a box for the leftover meatballs. I was not too impressed with the pizza. It is a large-sized one (probably 8″) and I couldn’t eat more than two quarters. The edges looked (and tasted) burnt and the mozzarella lacked the fresh and creamy gooeyness. The roasted tomatoes added a neat little sour punch although I thought that the taste was more redolent of sun-dried tomatoes. Not complaining, mind you. The pesto felt fairly dry in texture and I couldn’t detect any notes of pistachio in there either. 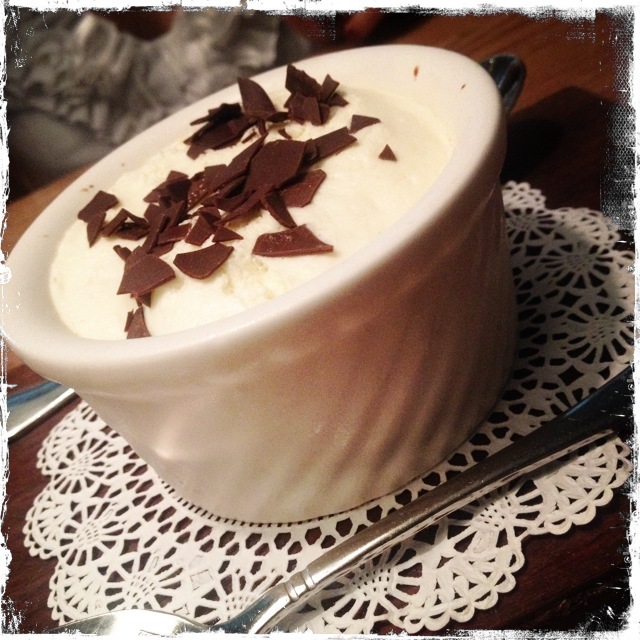 Main course done, we decided to split an order of Classic Tiramisu (Pavesini, mascarpone mousse, espresso, dark chocolate). It came in a little white ramekin, pretty and petite. My thoughts? I felt it was very light and smooth in texture, almost frothy and pillowy in its soft creaminess… but too milky-sweet and eggy for my taste. I’d have preferred a darker flavor. In fact, I think I’ll avoid Tiramisu in the future. Every once in a while I turn a blind eye with regards to the presence of eggs in desserts but mostly I feel strongly about avoiding them, so I will simply make a resolution and stick to it… good luck to me! Would I go back to Cibo E Beeve again? Not sure. The menu has a few nice-sounding vegetarian options but probably not enough for me to justify another trip. Maybe the next time, I will simply ask the server if the chef can make me a vegetarian dish. Going by how nice the server was (he was attentive, helpful and pleasant), I think I have a good chance. Actually, most of the menu items sound like they can be made into meat-free (even vegan) options. Take, for instance, the Chicken Pesto Sandwich (peppers, goat cheese, pesto, arugula on a sourdough roll). Keep the chicken out and I think it would make for a great vegetarian sandwich. The Ricotta Ravioli Pasta (zucchini, amatriciana sauce) sounds lovely but I wonder if the sauce is vegetarian. I doubt it is. Then there is the Fusilli Pasta on the dinner menu (rapini, sausage, chestnuts, pecorino) that would be great, I think, sans sausage. Hmmm, maybe I should go check out dinner one of these days.